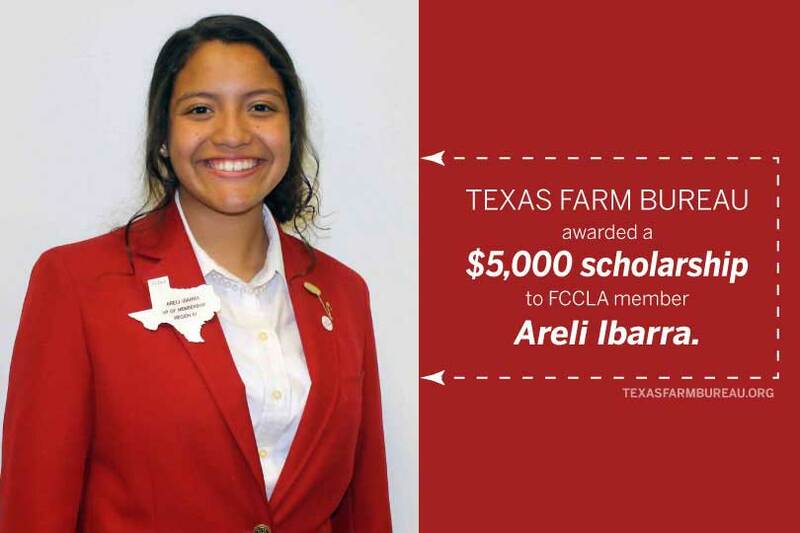 Texas Farm Bureau (TFB) awarded Areli Ibarra, a senior at Madisonville High School, a $5,000 scholarship during the Texas Association, Family, Career and Community Leaders of America (FCCLA) state conference. Each year, TFB awards one scholarship to a state or regional officer of the Texas FCCLA who majors in a field of study related to family and consumer sciences. Ibarra plans to attend the University of Texas at Austin and major in biology. In the future, she wants to attend medical school and become a pediatrician. Ibarra is the Region IV vice president of Membership for Texas FCCLA and the local chapter president. She has also served as the state vice president of Public Relations for the state organization. In addition to FCCLA, she is active in several other organizations and extracurricular activities at Madisonville High School, including varsity marching and concert band, Student Council, is the National Honor Society president and vice president of the Prosperity Bank Junior Board. “Areli has held leadership roles in FCCLA and other organizations, and she has maintained a high grade point average while doing so. We believe Arelia has a bright future ahead of her,” Balko said. FCCLA is a nonprofit career and technical student organization for young men and women in Family and Consumer Sciences education in public and private schools through grade 12. TFB District 4 State Director John Paul Dineen III presented the scholarship to Ibarra during the state conference. Click here for more information on Texas FCCLA and other youth opportunities through Texas Farm Bureau.